My running for mayor this May 2019 elections will probably come as a suprise to most of you. Even my closest circle of friends were not aware of my sudden decision to return to the political scene of Bacolod again. But I have carefully and prayerfully considered all probable consequences amd challenges between coming forward or staying in the sidelines. For me, it is not only a question of whether I can win or not – it is more about whether Bacolod can win or not? For almost three decades, the same people offer themselves for public service. Despite the obvious need for new ideas, for fresh directions, for innovative solutions, the same faces and names dominate our city’s political landscape. Since the choices are limited, it has become easy for politicians with strong political machineries to continue in power. Without passing judgment on anyone, this seeming lack of new leaders especially for top positions have stifled the growth of our city in major aspects, hindered its full potential, and impeded healthy experimentations of new solutions and ideas that usually characterize smart cities around the globe. We still face the same problems from several decades ago – poor traffic management, low citizen’s engaagement in governance, poorly managed waste, lack of clear strategies to address rapid urbanization, slow adoption of mechanisms to ensure healthy business environment, issues on public finance and a dearth of sustainable and long term solutions over and above palliative and reactionary measures, to name a few. These problems are compounded by constant in-fightings and conflicts between and among leaders as well as a highly-politicized bureaucracy. My vision is to see Bacolod rise above its current state to greater heights – not only from externally but internally – a city that will become a true example for other cities to emulate in terms of open governance, innovation, social development, knowledge economy, and environmental management. I have always articulated to public all the ordinances I have principally authored – and I rise now for the opportunity of breathing life to all of them. My devotion to the various sectors who will attempt to question my sincerity need only to read all my ordinances as a councilor to know I mean business. This can only come about by scaling the quality of our political exercises to a higher level. By giving people a choice between mere promises and concrete strategies. By allowing voters to refuse to believe in words and be influenced by fleeting favors and money and inspiring them to take responsibility of creating their own future through their own decisions. My mission is to help Bacolod WIN over these recurring concerns and issues, which apparently has been poorly addressed despite the passing of so many years. May 13, 2019 is still very far and we have ample time to magnify the discussions to a more detailed level, but let me lay down the principles of my governance now. 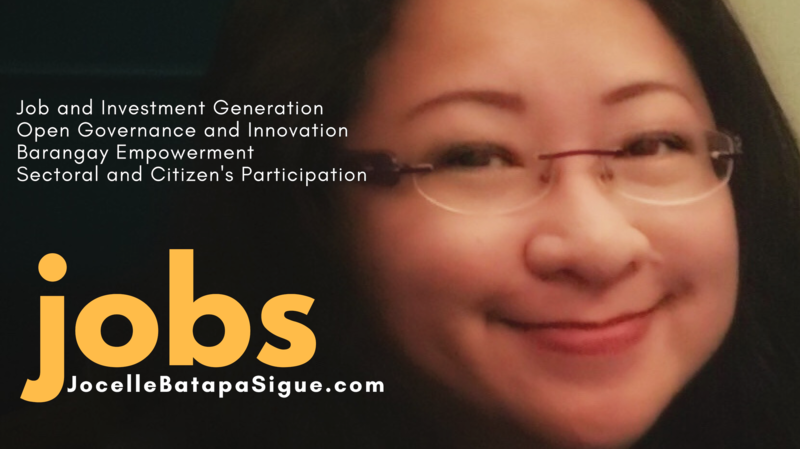 I am known for having led the creation of information and communications technology (ICT) jobs in Bacolod – this actually inspired me to keep going and spread the strategies to other cities. Hence, for easy recall I am carrying this consistent brand as JOBS for Bacolod, short for Jocelle Batapa Sigue for Bacolod. JOBS means productivity. It means self-worth. It means a whole family’s welfare. Job creation has always been my strategy to help improve our communities. Today, JOBS take on a higher meaning for Bacolod. Executive-Legislative Communications Plan (a set of working principles between two co-equal body of the city to harness more productive relations and proper performance of mandate). One of my goals is to harness genuine collaboration and mutual respect between the executive and legislative branches of the local government in the performance of duties and responsibilities under the law fostered by open communications and all mandated mechanisms like the ELA. My target output is an Executive Legislative Agenda within the first 100 days of office with private sector participating in every stage, each councilor shall receive support for on his or her committee works, programs and projects, creation of executive policy support desk for all committees to ensure collaboration between executive and legislative, inventory and classification of all existing ordinances by executive liaison officers and immediate submission for recommendations/suggestions to the respective departments concerned. All reports and recommendations shall be submitted to the office of the mayor. Another area of serious concern is the city’s full compliance with new Ease of Doing Business Law especially the No-Contact Policy. In the first 100 days, inventory of all systems and processes according to the EODB law. Executive Order Creating a Special Composite Composite Committee To make Bacolod Fully Compliant with the EODB Law. The decision to run for mayor is a very difficult one. It took a very deep level of personal reflection on my part to finally take this ultimate sacrifice. When I decided to leave politics in 2016, I was already prepared to simply become an ordinary citizen – but the same ordinary citizen is called to do an important task today. My sense of duty to my city is so overwhelming that my heart has become oblivious of all the dangers and hardships that this mission will expose me to. When I was requested last week by several people to take this post, part of me immediately thought this was my chance to help Bacolod fly, but part of me just felt so scared and small. Who am I to face the giants? Until people who knew began to tell me who I am. My family and friends made me stronger by telling me that it is time. Some of them reminded me of all the realities in politics and discard all illusions that I can do it alone. I have no illusions anymore. I will not seek for people to like me, instead I will seek for people to love and fight for our city. I do not have the resources to win but I will continue to charge on with complete faith and trust in the Lord’s plan for me. Losing is not an option because today I know in my heart Bacolod can win. But the idea of losing is take my eyes off the vision. I do not have all the solutions. We are all going to do this together. I shall come forward in behalf of my generation and those younger than me so we can carve the future of this city. This mission, this fight, this is not for me or the alliance which I am a part of. This is nor against my political opponents. This fight is for the future we all dream of. Highly qualified executive leader and manager with over 26 years of experience in leading teams, companies, institutions and large organizations with proven ability to achieve targets and deliverables according to the mission and strategies of these entities. Possesses the leadership ability to lead stakeholders in creating shared vision and agenda to reach goals. Adept in legal knowledge and office management as a lawyer and senior law firm partner for 20 years. Possesses excellent team management and communications skills as an academic professor for 21 years, and national organization leader for various organizations for over 16 years. Passionate about the growth of jobs and investments especially in the countryside as multi-awarded champion for ICT and innovation. Previous postWho is Jocelle Batapa – Sigue?